It’s ludicrous, when you think about it, all of these cars sitting idle in the garage unused and unwanted except for a few brief trips out of town on the weekends. In this day and age there’s no need for that kind of waste, in this day and age, there’s Zipcar, and when you put your Zipcar promo code to work you’ll save time, effort and money on the transportation you require without any of the waste. In the year 2000, two enterprising young entrepreneurs decided to follow their hearts and the model of existing German and Swiss companies to launch a new sort of car sharing service in Boston Massachusetts. When Zipcar opened its many doors in June of 2000, the concept was completely new to America, and following the old adage, once they built it up the people did come—flocking to the fleet of readily available vehicles to research, reserve, and drive away happy and hassle free. Zipcar is based on the idea that if you offer people the opportunity to take advantage of the perfect vehicle for whatever they need, when and only when they need it, you’ll be conserving resources and eliminating waste, while ensuring that all customers have their transportation needs met despite changing whims and requirements. Zipcar members are able to log in online or via the Zipcar mobile apps to review the vehicles available in their area and reserve a car. After that, all that’s required is a quick trip to the dedicated Zipcar parking lot and the car is available for as long as its been reserved. After use, the car is simply returned to the Zipcar lot and made available for the next customer, quickly, easily and conveniently. With Zipcar covering the costs of cleaning, insurance, maintenance and repairs and members paying only for the time they are actually using the vehicles, the Zipcar model represents any entirely new mode of transportation—the share car service, transforming the world through community. Hurry on over to Zipcar to sign up today and get driving tomorrow. To get started securing your Zipcar membership, head online to zipcar.co.uk with your Zipcar offers in tow and click “join!” to get started. Choose whether you’ll be joining as an individual with an account for yourself and your family or as an organisation, university or company. Choose where you’ll be using your Zipcar membership and Zipcar voucher for the most part (this will be set as your default location) and then enter a home address and click “Continue” once more. Enter your name, home phone number, date of birth and license number before providing your License expiration date and updating your account with any additional considerations and clicking “Continue” to redeem your Zipcar voucher. Click “Continue” and review your membership, making sure that you see your Zipcar discount code is safely secured, before you sign up with one of the fastest growing car sharing services in the world. With your Zipcar discount code in hand, navigate to the Zipcar online hub and read up on all the membership details before clicking “join!” to get started. Review the different membership options available and select whether you’ll be joining as an individual with an account for yourself and your family or as an organisation, university or company. After you’ve settled on the right sort of account, create a username and password and hang on tight to those Zipcar offers as you click “Continue” to set up your membership. Look over the specific pricing plans available to you (keeping in mind your Zipcar promo code) and then when you’ve found the perfect plan click “Select this plan” to confirm your choice and continue on with the sign up process. When you’ve made your payment and secured your Zipcar discount code savings, click “Continue” and review your membership, sign up today. Don’t forget to check them often, as you can never be sure when a free Zipcar Promo code might be waiting for you! 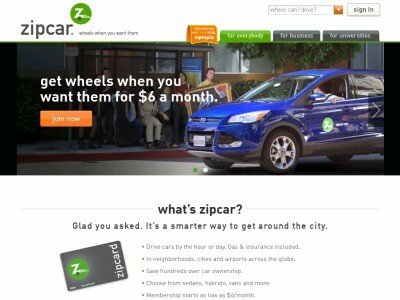 Buy now online at www.zipcar.com. When my brother and me left home, it didn't make economic sense to keep running two cars – but my parents still needed to reliably get around. Thanks to the Zipcar promo code I found online, they can hire a vehicle for anything from a quick trip to the shops to a weekend away. Zipcar offer a car club service that lets you access thousands of cars – just visit zipcar.co.uk and enter your Zipcar voucher to get started. So if you want an affordable alternative to owning a car, check out the latest Zipcar offers.